Tanagers are among the most colorful bird families in the world and the Green Honeycreeper, a member of the tanager family, is no exception. What is more interesting is the sexual dimorphism (difference in form and color) that exists within the species. In many cases, the male is significantly more vibrant than the female. However, in the case of the Green Honeycreeper, though the male and female are notably different, they both have strikingly brilliant plumage. The Green Honeycreeper is fairly common from southern Mexico down to the extreme northwest of Peru and extends over into northern Bolivia and Amazonian Brazil. In Ecuador, this species inhabits both the western and eastern slopes of the Andes. Although it is seen regularly at up to 1,100 (3,300 ft.) meters of elevation, it generally resides lower, particularly below 800 meters (2.600 ft.). It is partial to humid forest and secondary woodlands. 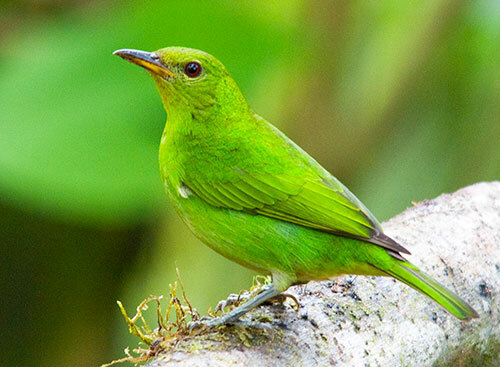 The Green Honeycreeper is one of the smallest of tanagers, measuring a mere 14cm (5 1/2 in.). It has a stout bill but less decurved than other honeycreepers. The beak is yellow with the culmen (upper portion) dark in the male but yellow in the female. The eyes are a dark red. The male has a lustrous bluish-green plumage, almost a teal, with a contrasting black head. The female, on the other hand, is a brilliant green all over, similar to a green apple in coloration, with the under-parts a little paler. The male is distinctive among the tanagers, whereas the female can be confused with young tanagers of other species. 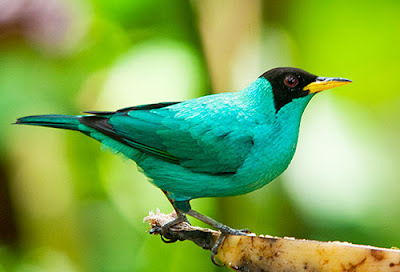 The Green Honeycreeper is arboreal like other tanagers but is generally seen in pairs, as opposed to small flocks. They will, however, frequently accompany other tanagers in mixed congregations hunting for fruits and berries among the rainforest foliage. The Green Honeycreeper is a strikingly beautiful bird frequenting the rainforest in the foothills of the Andes. An observant adventure will draw great enjoyment from observing this jewel of the forest. Areas to encounter this colorful species are Buenaventura Reserve, Copa Linga Lodge, Cordillera de Condor, El para Reserve, Milpe Bird Sanctuary, Manglares-Churute, Napo River Basin, Podocarpus-Bombuscaro, Pedro Vicente Maldanado, Rio Canande Reserve, Rio Palenque Reserve, Rio Silanche Bird Sanctuary and Tinalandia.